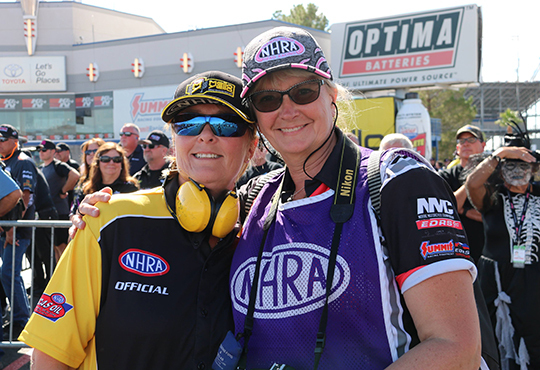 It was Annette’s fourth time as a guest of the NHRA Safety Safari. The first time was thirteen years ago when she and her sister Sussie got the opportunity to go for a tour with the Safety Safari. In 2013, it was time again and her third trip was in 2016 and then together with chief starter Harry Granlund who took the opportunity to join up for that trip. “That was a great experience, so of course I wanted to go along this time as well,” says Harry. “However, I had to settle for the Las Vegas race only since I could not be away for more than a week”. 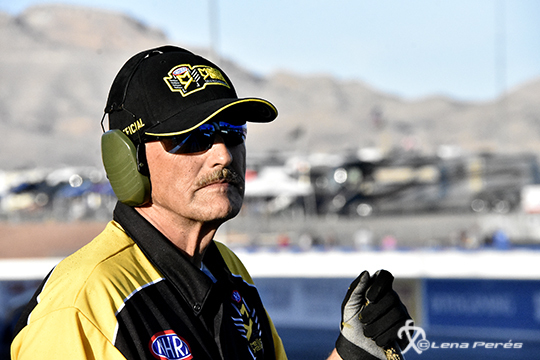 Göran Ekendahl took like a fish in the water in his job at the starting line of The Strip. 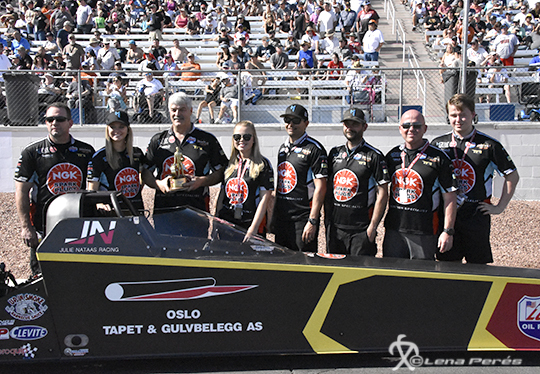 Also, the latest addition to the group of starters from Tierp, Göran Ekendahl, took the opportunity to experience a couple of NHRA races. Anette Heleander and Harry Granlund together with some of their friends in The NHRA Safety Safari. A fun and good experience, Göran being there as a member of the staff for the first time. According to these three experienced starters, the routines are a little different in the NHRA than over here in Europe. A US starter does not have the same responsibility over the drivers. For example, if they don’t have the right equipment or are used right standing in the starting position, they jcan go in to the starting position without any pointing from the starter. That, they mean, is in the driver’s own interest to use the safety equipment correctly and how it should be used. In addition, there are significantly more people on and around the starting area than what European rules allow. “It makes it a bit messy,” says Nettan. “It’s hard to see everything that’s happening and who does what. But the NHRA provides better resources and equipment than we have in Europe. 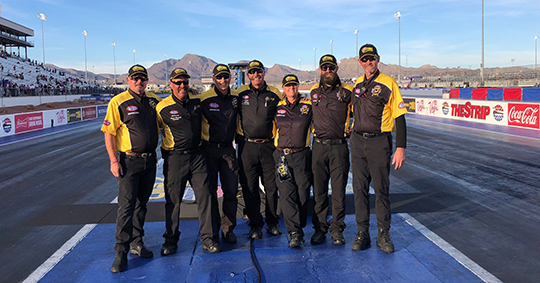 The staff is fast and efficient whenever there’s an incident and the level of safety is also extremely high at the NHRA races”. Anette “Nettan” Heleander takes care of the rubber that is removed from the starting line. A heavy and hot job in all aspects. The group from Sweden had a good opportunity to try out different positions during the weekend. 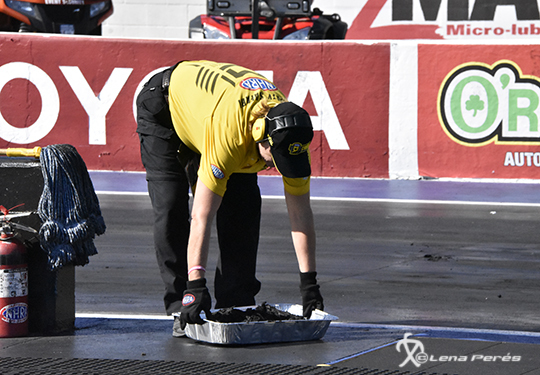 Most of the work was around the starting area, which included scraping rubber from the track. The traction is extremely good which means there’s a solid layer of rubber on the track after the big slicks classes have run. This must be removed so as not to cause rubber getting loose for the following class. Harry Granlund worked most of the time at the starting line, but also got a day in the tow truck. There he felt at home as it is his everyday work at home. Harry decided to stay with the Safety Safari tow truck one day, to compare with what he drives in his everyday job at home. Göran went off to the finish line to help push cars off the track. “There’s also a little bit of difference in how the crew is serviced, at least compared to Tierp,” Nettan says. “Food, for example, is up to ourselves to fix. The main team usually arranges something to eat, and in the evenings someone in the team usually makes something simple for everyone”. The Safety Safari team is a complex and well-run group of people, the main group goes to every race and then there are a number of locals who show up at the local races. But it’s always a good experience to have guests from other counties, like the Swedes. And of course it was cool to meet a female chief starter, actually the only one in the world. And of course there were quite a few showing up in a photo session with Nettan. 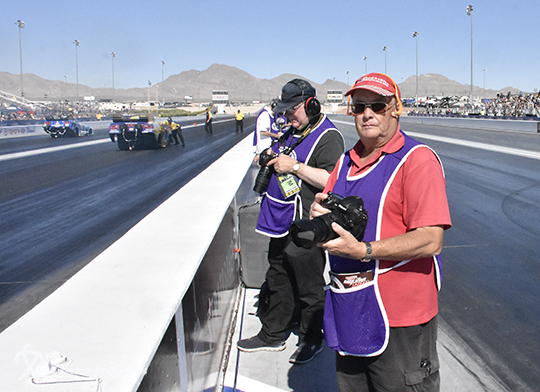 “A big wow was when Graham Light, the former Senior Vice Precident of NHRA, came out to meet us and welcomed us to the track,” Nettan says. “He retired from his duties this year”. 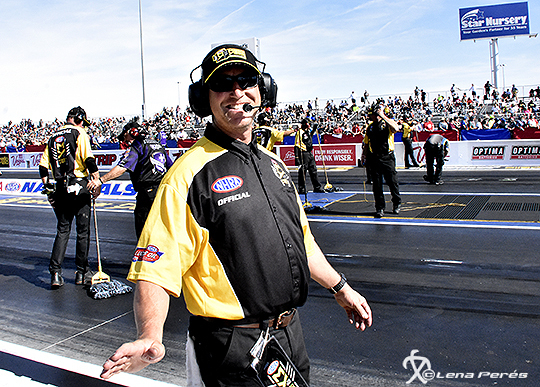 Yours truly was given the opportunity to experience an NHRA race from the inside. An experience that hopefully will be repeated. Here with good friend and collegue Kelly Wade from Summit Racing Equipment. 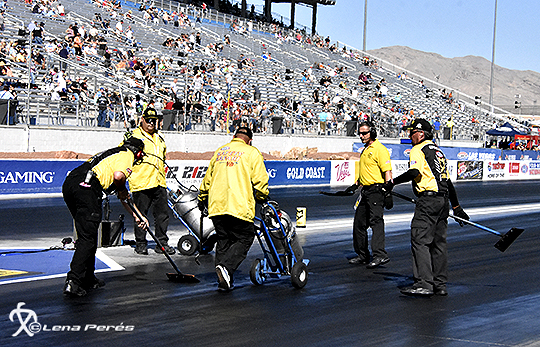 As a media marshal of Speedgroup, I was able to check out the media department at the NHRA Toyota Internationals in Las Vegas. So I’ll add some words about how that part works compared to Europe. 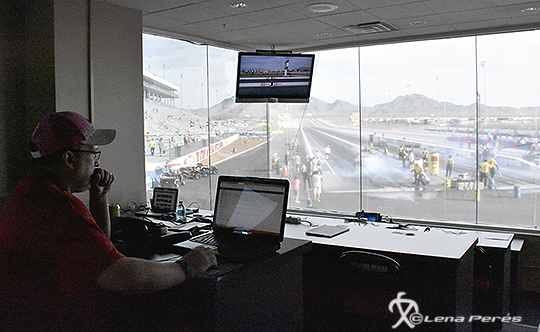 NHRA has a well-developed media department located right at the starting line, with a view of the whole track. In the same building there is the main tower, radio, television and camera rooms, as well as spaces for journalists and photographers. All very well planned out and with full service for the media crews. The media staff have a good view over the startline and strip at The Strip in Las Vegas. A cinema sitting area with internet connections and a view of the starting line and the track makes it easy to see which classes are running and if something special happens out there. Easy access to the track makes it very easy to be at the right location whenever you want. And I also noticed that the track side barriers were not as high as back home in Europe. That made it easy to work as a photographer, even if it was crowded with photographers. Good to know is that it did not take away any of the safety aspects. 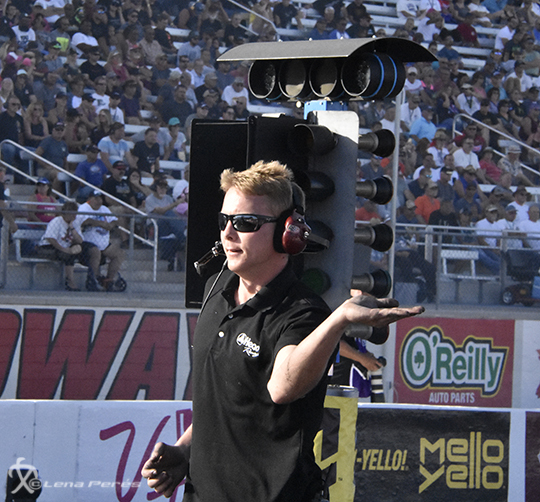 Well, as a photographer you always have to be aware that this is not the safest place to be at a drag strip, you always have to be careful and aware of what is happening around you. 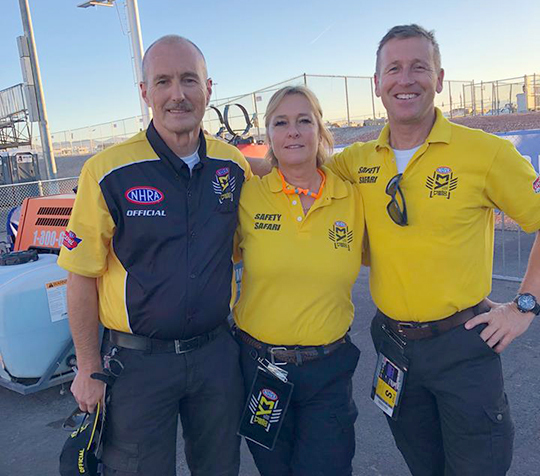 The happiness when you meet Roger Gorringe and Simon Groves, colleagues from Europe on a race track in the United States. 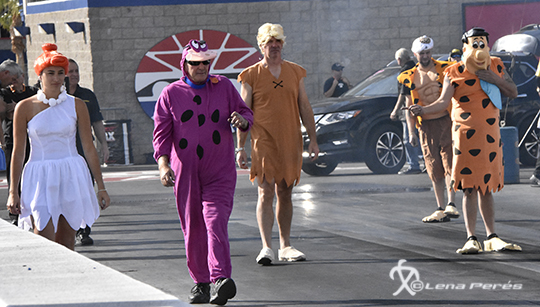 Now it was not that strange as these gentlemen go there every year to work at some of the NHRA races. Andy Willsheer was also here but is the missing in the photo. There are of course firm restrictions on where photographers are allowed to be around the starting line. But also because there were a lot of people and activities from drag racing and track crew going on. Again we noted that the starting line was more crowded than we are used to back home. -It was a great experience to be part of The Strip’s media staff, I can say. I’m extremely grateful to have this experience in my luggage. 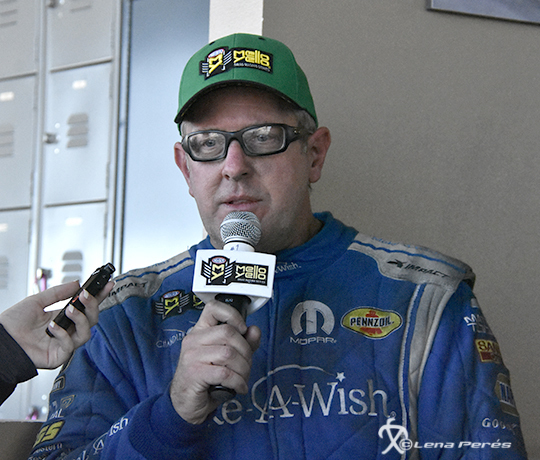 It was also no disadvantage to meet all the “big” drag racing stars either, many of them came up in the media room for interviews. In the pressroom there are always opportunities to meet and listen to very well known drivers. 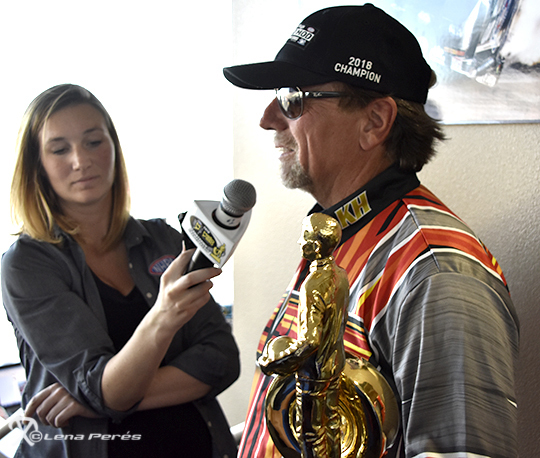 Here we had Pro Modified driver Mike Janis in an interview by Jennifer Goethel, the NHRA media relations manager. This guy is familiar with a lot of Europeans. Tommy Johnson Jr did great in Top Fuel some years ago over here. 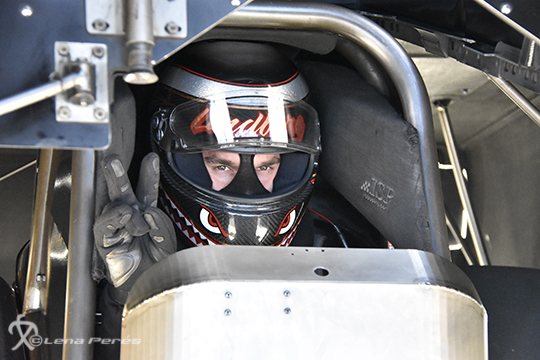 And now he´s one of the fastest in Funny Car back home in US, compeeting with, among others, Jonnie Lindberg. Here in an interview at the media center at The Strip. In a few days he is getting married to his Amy. Congratulation both of You guys from Europe. The ladies room was a great place to meet celebrities. The meetings get normalized in this natural meeting room, and you don’t get that star-struck. 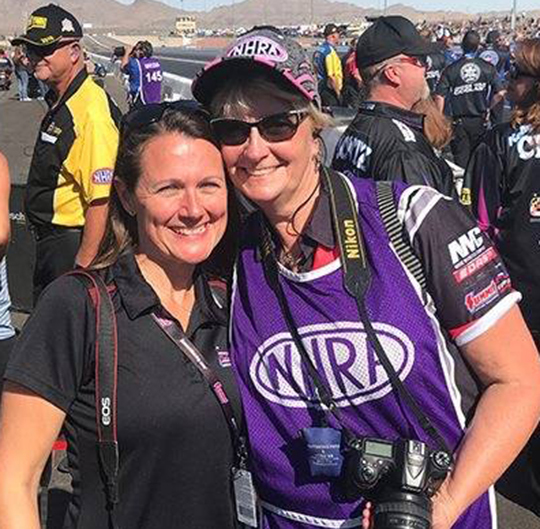 I myself got a date with legendary Linda Vaughn during a visit and Nettan had a catch up with Top Fuel driver Leah Pritchett during similar conditions. Julie Nataas and team awardes with the Never Rest Performance Award while in Las Vegas for her and teams good performence over there. The Leanders Bros was of course on site as some of all the familiar people from home. By the way, we met lots of English, Swedish and Norwegians who were on site, either working, driving, visiting or crewing, and this made us feel very much at home. 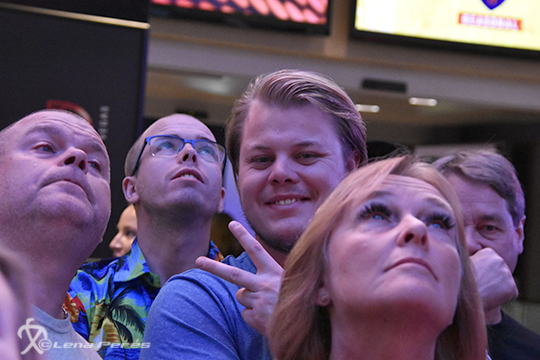 The Strip in Las Vegas was visited by many Swedes in October. 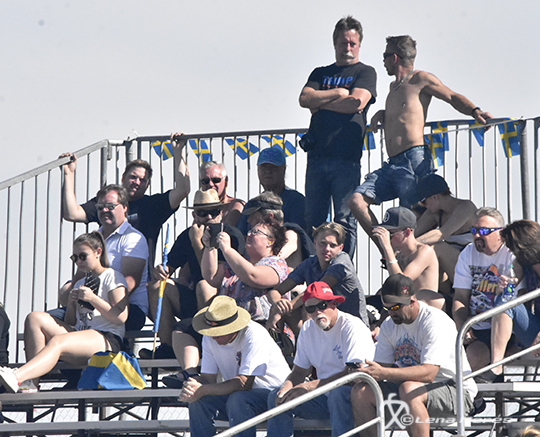 Some went as spectators, others went racing and some were included in the staff. 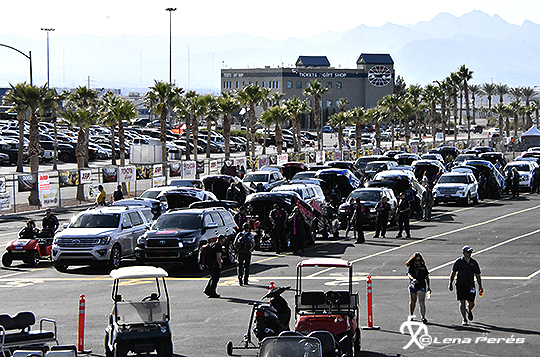 A view of the lineup on The Strip. 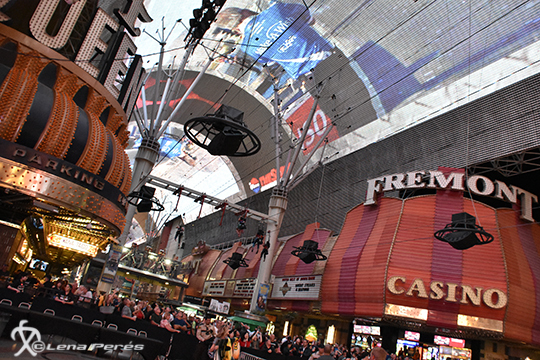 A must when visiting Las Vegas is to take a drive on Fremont. A very crazy street in the middle of town where you’ll find all kinds of people. Among others, you can find well-known Swedes. We found the Kuhns family. 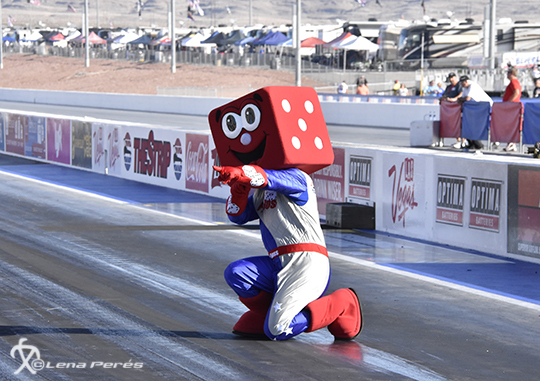 Another good reason to visit The Strip and the NHRA Toyota Nationals in Las Vegas in October is Halloween. And it was definitely picked up by the drag racing crew. 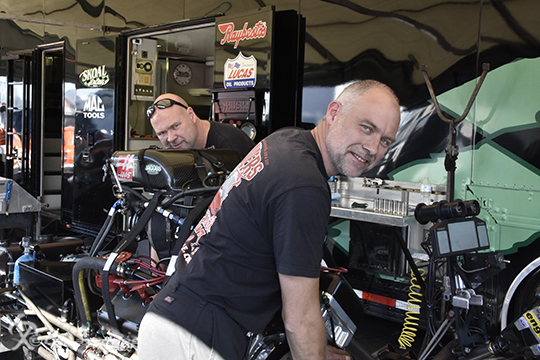 And of course we met up with our Jonnie Lindberg in the Jim Head Racing Funny Car. It’s always fun when you can catch a fast driver with the camera. 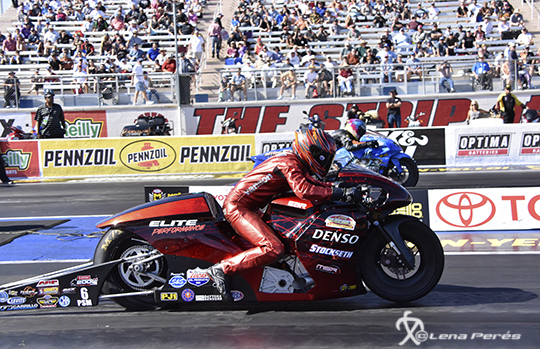 Here is one of the fastest and quickest Pro Stock Motorcycle drivers in the world, Matt Smith in action. At the grandstand there is always a group of Swedes who encourage the drivers with the Swedish flag. Austin Bergqvist is familiar with a lot of us, as he is the son of “Bagarn” and Birgitta Bergqvist at Autoshop in Florida.